Give your home or business character by updating your floors with our store's appealing and long-lasting tile flooring in Carroll, IA. These flooring products come in many colors, shapes, and styles. At our large flooring showroom, one of our friendly and helpful staff members can show you how tile can perfectly blend aesthetics and durability to improve the appeal and value of your property. Choose from a wide variety of options available in ceramic tile, porcelain tile, and slate tile. Reliable Longevity: Ceramic, porcelain, and slate are all known for their density and strength. Their rigid surfaces mean they can withstand everyday foot traffic with ease. Together with high spill, stain, and impact resistance, tile is a smart choice for lasting dependability. Easy Maintenance: Tile flooring is well-known for its non-porous composition and use of stain-resistant finishes and glazes. This means that this flooring material requires little maintenance. Simple to Clean: Dust, dirt, and allergens are easy to spot on tile, which means cleanup is just as simple. Just use the proper cleaning solution, a cloth, and a damp mop to pick up any debris. Your investment will look good as new in no time. Improved Indoor Air Quality: There is no need to worry about loose fibers or unsettling fumes with tile. With this flooring material, you are able to breathe easier and focus on what matters most to you. Hypoallergenic Benefits: Dust particles and similar allergens are unable to “cling” to stone, ceramic, and porcelain. As a result, people who are sensitive to dust and pollen have an easier time in tile-floored rooms. Maintain routine cleaning for a dust-free environment. Many Styles and Colors: Since tile can be mixed and matched to create unique designs, its customization options are limited only by your imagination. From single colors to themed presentations, tile has you covered. Choose an impressive way to redo your floors. By installing durable and stylish ceramic tile, you effectively change the entire ambiance of a room. We have so many tile shapes, sizes, hues, and textures. In addition, some of our tile products look like wood. Browse the impressive selection at our flooring store. We know you’ll find exactly what you need. These versatile flooring products give your place the makeover it needs. Do you want an alternative to carpet, vinyl, or hardwood? You can express your unique sense of style with a tile floor made of ceramic. These floors also have practical benefits as well. They do not stain, and they are excellent in high-moisture environments. In addition, they are virtually maintenance free. Sweep and mop occasionally, and your tile floor will maintain its beauty. Ceramic is known for its strength. It also provides a distinct sense of beauty. Glazes and finishes allow this flooring material to be available in many different styles. In addition, textured options are available for that distinct, underfoot feeling. So whether you are looking to update your interior with an Old World charm or contemporary aesthetic, ceramic can set the right environment. Give your place a modern look that is both simple and stylish. Able to retain its color and beauty yet hold up under heavy foot traffic, porcelain tile is an excellent choice for many homeowners. It works well in homes with children and pets as well as offices and other commercial businesses. This impressive and elegant flooring product allows you to create a truly unique look for your property. You won’t have to worry about it fading, staining, or succumbing to moisture problems. Even after years of use, these floors continue to look most attractive. Porcelain tile is as aesthetically pleasing as it is strong. Select your preferred style, color, design, and texture from our large selection. After that, we’ll provide a free room measure and then arrange for installation. Some of the brand-names we carry include Floorcraft and Star Values. On top of that, the high-density composition of porcelain makes it a great flooring material for both indoor and outdoor settings. So whether you are re-flooring the kitchen or patio, you’ll find something to love with porcelain tile. Its beauty is matched only by its strength and dependability. 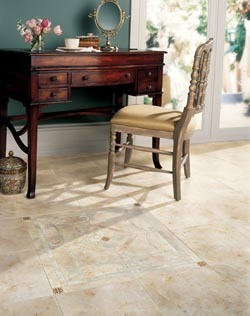 Go natural by installing slate tile floors at your home or business. These beautiful flooring products can be installed inside or outside to create a truly distinctive look. Slate comes in a range of earth tone colors and in many different styles. Its tough composition makes it resistant to scratches, scuffs, and color fading. Even though it must be sealed regularly, a slate file floor will last for more than a lifetime. When you want a natural and earthy appearance to your interior, you slate is the right choice. It has a natural appearance because it is manufactured from stone. As such, the beauty and majesty of the earth are laid bare when you choose this material for your interior remodeling project. Slate installations have lasted for generations, so when you choose this material you are making a lasting investment for your home’s aesthetics and resale value. Choose your floor, and we’ll install it for you. We have a long list of highly qualified flooring installers that are available to provide exceptional work. Whether you want natural stone, hardwood flooring, or ceramic tile floors, we provide tile flooring installation to make your dream floors a reality. Of course, an installation is more than a “placement.” It’s a work of art. Express your creativity with the help of our team. Our sales associates work with you to plan, design, and coordinate your installation project. From checkerboard patterns to room borders, we can procure the right tile to create the designs you want. Describe the kind of tone or atmosphere you want, and we’ll help you realize your vision. Likewise, you can count on our tile installation technicians to execute your plans in a timely and accurate manner. Our associates are thoroughly trained, and we stay up-to-date with the latest installation procedures. From start to finish, we ensure every step of your project is completed according to your high standards. Contact us to speak with our friendly sales agents about your upcoming tile flooring project. We proudly serve customers in Carroll, Denison, Jefferson, Harlan, and Lake View, Iowa, as well as the surrounding areas.